A new study conducted by the California Independent System Operator (CAISO), which oversees the state’s electric grid, First Solar, and the National Renewable Energy Laboratory (NREL), points to the untapped potential of utility-scale solar facilities and their ability to provide important services needed to ensure the stability of the state’s electric grid. According to an article posted in the EC Energy Collective, the findings of this new study have significant implications for the integration of not just solar power but of all renewables on California’s grid. California is charged with ensuring that at least 50 percent of its electric generation be driven by renewables by 2030. The challenge for the state will be to find new ways to balance this generation and load with managing the variability of increased renewable generation to maintain grid reliability. The California Building Standards Commission (CBSC), the state agency responsible for statewide adoption, has requested that NFPA provide 2017 NFPA 70: National Electrical Code (NEC) pre-adoption training for its five state agencies later this year, illustrating their willingness to look at the requirements prior to the start of the state’s next triennial adoption cycle. There are five new NEC articles that cover topics not addressed by the most recent edition of the California Electrical Code, which is based on the 2014 NEC. These include articles addressing large-scale photovoltaic (PV) electric power production facilities and new technologies like energy storage and direct-current microgrids. The CBSC, in coordination with the Sustainable Energy Action Committee (SEAC) developed a CBSC information bulletin 16-02 to support the need for TIAs covering Energy Storage Systems (ESS) and PV requirements issued by NFPA for the 2014. SEAC is comprised of a broad cross-section of the industry and their focus includes supporting requirements for and implementation of energy storage systems and PV systems. From NFPA’s perspective, it’s a promising sign that regulators and the private sector in California recognize the value of the 2017 NEC changes including PV and other sources of alternative energy. Their willingness to move forward with the TIAs for the California Electrical Code to reflect some of the important 2017 PV and ESS requirements speaks positively to the investments states are making to keep up with the newest advances in the industry. In must be noted, too, that in addition to one state (Massachusetts) that has completed its 2017 adoption process, there are 23 other states that are in the process of updating their statute or administrative rule through which the NEC is adopted to reference the 2017 edition. For more information, read the full article with links to the report, and let us know you thoughts. Photo courtesy of EC Energy Collective. The National Institute for Occupational Safety and Health (NIOSH) has a long-standing research program in firefighter safety and health. Because the demands and hazards of wildland firefighting differ in some important ways from structural firefighting (such as the need to carry heavy equipment over difficult terrain and long work shifts that may last multiple continuous days), NIOSH recently introduced the NIOSH Wildland Fire Fighter On-Duty Death Surveillance System. Of particular note to NFPA audiences is that our own Fire Incident Data Organization (FIDO) is one of three data sources that NIOSH is utilizing in creating this data collection system. Just to be clear, surveillance in this context refers to the public health practice of systematically collecting and analyzing injury data in order to help identify opportunities for prevention. Think of fatal injury surveillance data as representing the “who, what, when, where, how and why” elements of injury events. By studying trends and identifying the circumstances of these deaths, it will be possible to better identify risk factors and to support prevention measures. The reason that NIOSH is using three reporting systems is that different systems have different methods of identifying and defining cases for inclusion. Different criteria may be used in determining what constitutes a work-related fatality, for instance, such as whether to include a firefighter who suffers a fatal heart attack following an arduous work shift, but who was no longer on duty. Consequently, even though each of the reporting systems follows the same outcome of interest – wildland firefighter deaths -- they may produce slightly different numbers. By drawing from each of the three data sources, NIOSH hopes to create as complete a count of wildland firefighter deaths as possible, and also to assemble more detailed information on injury events than is available from a single data source. NFPA’s internal FIDO database itself is an information-rich database that draws upon multiple data sources, including fire departments and other investigation reports. Launched by NFPA in 1971, FIDO data also includes records for significant fire incidents that don’t involve firefighter fatalities. In addition to FIDO, the other two data sources that NIOSH will be using in its surveillance effort are the National Wildland Fire Coordinating Group (NWCG) Safety Gram and the firefighter fatality data system sponsored by the United States Fire Administration (USFA). As the new system evolves, it should facilitate research that homes in on some of the special hazards of wildland and identifies opportunities for intervention. I’ll have more on the new surveillance system and some of its early findings in a follow-up blog. With the recent release of the "Needs Assessment of the U.S. Fire Service" report, it may be challenging to really understand and capture the needs of the U.S fire service with the massive amount of great information this report provides. To view all of the biggest takeaways from this report, make sure you take a look at our easy-to-read Infographic available to you here. This document gives you a detailed, yet clear-cut picture of the needs and challenges that our fire service faces each year. You can also download the infographic, fact sheet, full report (also available in the link above), and more information about this report here. For the past few months, NFPA has hosted a series of videos to help explain the significant changes to the 2017 edition of NFPA 70: National Electrical Code (NEC) that impacts the electrical industry as a whole, as well as the work you do every day. We’re pleased that so many of you have taken the time to view this series and have utilized our Xchange platform to start discussions and ask questions about the code. This latest video is the last in our series but one that is extremely relevant to many of our industry stakeholders. In the video I talk through some of the most significant changes that impact alternative energy technologies and electrical vehicle supply equipment. There are four new articles added to the 2017 NEC covering alternative energy systems that I covered in our first video but in this segment I discuss important changes to existing articles such as 625 on Electric Vehicle Supply Systems and 690 on Solar Photovoltaic Systems. Article 625 is one such article that’s in the technology fast lane. Inductive charging systems, now referred to as wireless power transfer, are now covered in Article 625. New rules covering the installation of wireless power transfer equipment now reside in Article 625. This article is an example of why it is so important for the NEC to be regularly updated to include rules for safe installation and implementation of new technology in homes, businesses and other occupancies. Equally important is for the regulatory community to take advantage of NFPA’s efforts by adopting the most recent edition of the NEC. We also include in this video, other impactful changes from the 2017 edition that you absolutely need to know, including updates to requirements in Articles 690 and 705 for photovoltaic systems that are interconnected with another source of electrical power. First responder protection when responding to incidents at buildings or structures with PV systems has been enhanced through revisions to the requirements for rapid shutdown of photovoltaic systems on buildings or structures. You can watch the full video for free if you are logged into Xchange. If you haven’t registered for Xchange yet, it’s really easy to do. Just look for the login link above to login or register for your free account on Xchange. Once you’re logged in, you will have access to the full webinar, in addition to related free content and discussions with your peers across the country and around the world. Don’t miss out; get involved today! Twenty-six years ago, on February 23, 1991, a fire broke out on the 22nd floor of One Meridian Plaza in Philadelphia. Twenty-five people were injured and three fire fighters lost their lives. "An early-evening fire in a 38-story, highrise building in downtown Philadelphia on Saturday, February 23, 1991 resulted in the deaths of three fire fighters, fire extension to nine floors, and severe structural damage to the building. of origin--to the 29th floor. Ultimately, an automatic sprinkler system supplied with water by fire department pumpers through the siamese connection halted vertical fire spread at the 30th floor." We recently mailed the Survey of Fire Departments for United States Fire Experience During 2016 to 20,490 fire departments throughout the country. We are hoping for a great response rate, because the results of this survey are used to compile the U.S. Fire Department Profile report that is published every year. This report is important because it tracks a number of critical data points, including the number of volunteer and career firefighters in the United States, the number of volunteer, combination, and career fire departments, the population protected by each department type, age and demographic data about career and volunteer firefighters, and the amount of money spent on fire protection services in the United States, just to name a few. Because the report is published annually the data in it can be used to identify trends in the fire service. The more departments that complete the survey, the more accurate and meaningful the data in the report will be. It is particularly important to have a large number of respondents from smaller fire departments so that we have a representative sample to draw from. Fire departments can complete and return the paper survey by May 2, 2017, or the survey can be done online at www.nfpa.org/FEsurvey2016. In order to take the survey online, an NFPA Code and Password is required. This can be found on the paper survey that your fire departments received. If your fire department does not have this information and wishes to complete the survey, you can contact us at nfesurvey@nfpa.org or 1-800-343-8890. An attack fire hose safety bulletin was issued today by NFPA to remind fire departments about the importance of purchasing, maintaining, inspecting, removing and repairing fire hose in accordance with NFPA 1961: Standard on Fire Hose and NFPA 1962: Standard for the Care, Use, Inspection, Service Testing, and Replacement of Fire Hose, Couplings, Nozzles, and Fire Hose Appliances. In recent years, fire hose thermal degradation has been cited as a concern during fire hose failure incidents. Following a tragic incident in Boston that took the lives of two firefighters in 2015, NIOSH issued a report that called for more research, dialogue, review of fireground tactics, and responsiveness from fire service research organizations, equipment manufacturers, standard-makers, and fire departments. Scrutiny about fire hose characteristics and capabilities comes at a time when fires are burning more intensely than ever. Today’s open floor plans, construction materials and modern furnishings are causing flashover and structural collapse to occur faster. Firefighters have less time to fight fires and safely escape. It’s important that they have equipment that is in excellent working order, per the code, to withstand the intense fire environment. NFPA and others are looking at whether fire hose can be improved. The Fire Protection Research Foundation conducted a workshop on Fire Hose in Support of the Technical Committee in 2016, and recommendations were shared for consideration in the next edition of the code to be released in 2019. Another report will be released next month on firefighter equipment and thermal conditions. Post and share this bulletin. This past Monday, February 13, a fire broke out in the Mickey & Friends parking garage at Disneyland in Anaheim, CA. The fire was reported to officials prior to 5 p.m. While the exact source of the fire is still under investigation, news sources are reporting that officials have targeted one or two vehicles where the fire may have started. The fire resulted in damages to 8 vehicles that reported direct damage from the fire or indirectly from radiant heat at a cost of at least $180,000. 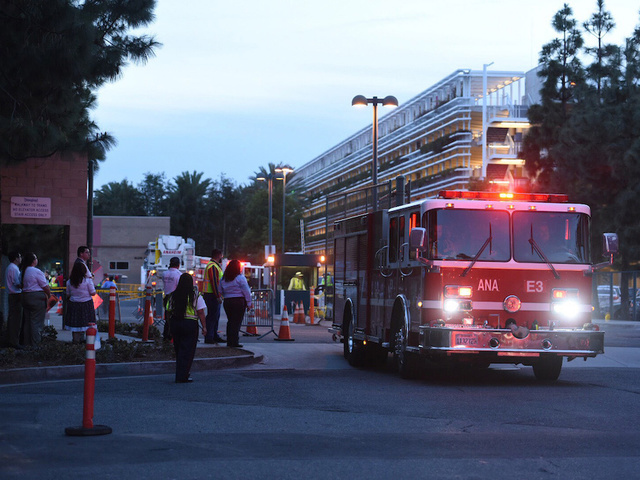 Seven Disney employees were sent to the hospital to be treated for smoke inhalation. NFPA 1, Fire Code, Chapter 29, addresses protection requirements for new and existing parking garages. Chapter 29 covers parking garages or structures that include buildings, structures, or portions thereof used for the parking or storage, or both, of motor vehicles. Parking structures come in many forms and are permitted to be enclosed or open, to use ramps, and to use mechanical control push button–type elevators to transfer vehicles from one floor to another. Motor vehicles are permitted to be parked by the driver or an attendant and are permitted to be parked mechanically in automatic facilities. 29.1.1 The protection of new and existing parking garages, as well as the control of hazards in open parking structures, enclosed parking structures, and basement and underground parking structures shall comply with this chapter and Section 42.8 of NFPA 101. 29.1.2 Construction and protection of new parking garages shall also comply with NFPA 88A, Standard for Parking Structures. 29.1.3 Chapter 29 shall not apply to parking garages in one- and two-family dwellings. parking structures. NFPA 88A does not apply to one- and two-family dwellings. High fuel load due to the presence of fuel in vehicles. Vertical openings. Parking structures are built as one big vertical openings with floors being connected by ramp systems. This could allow for smoke and fire to spread quickly. Openness. Many parking structures are open to the outside air which aids with natural ventilation of fire and smoke. Those that are enclosed require additional protection measures. Unfamiliarity of occupants. I can never find my way out of a parking garage. I follow signs for stairs and exits and always seem to get lost. I can't be the only one! Fortunately, we do not seem to hear about fires in parking structures all that often. Our codes and standards do their job in protecting occupants and property and provide adequate access for fire department operations such that these occupancies do not tend to be in the spotlight. Fortunately, when a fire does occur in a parking structure, fire protection systems and the fire department are usually able to do their job quickly and with minimal damage. #101Wednesdays: Do you know the way to (the) public way? I'm still getting back into "work mode" after a wonderful long weekend getaway to Vermont, filled with cross-country skiing, great food, amazing Austrian-styled beers (from the microbrewery owned by the youngest son of Maria Von Trapp of ‘Sound of Music’ fame), and snow. Lots and lots of snow. (Did I mention snow?) Anyone in the life safety business knows you can never fully go on vacation. You’re always looking for the sprinklers and exit signs. So of course, in the midst of a winter wonderland, my thoughts turned to, “Is the exit discharge being properly maintained?” (That’s right, vacationing with me must be a real treat.) In her recent #FireCodefridays blog, NFPA 1 staff liaison Kristin Bigda wrote about the importance of keeping fire hydrants shoveled out for fire department access. The same holds true for the exit discharge; it needs to be kept clear of impediments, including snow, to allow occupants to safely egress to the public way. 3.3.220 Public Way. A street, alley, or other similar parcel of land essentially open to the outside air deeded, dedicated, or otherwise permanently appropriated to the public for public use and having a clear width and height of not less than 10 ft (3050 mm). The key words in the definition are “deeded, dedicated, or otherwise permanently appropriated to the public for public use.” This is a location where a building can’t be constructed at some point in the future. The parking lot outside your office building probably doesn’t meet the definition of public way because there’s nothing to stop the owner from putting a building there. In the case of NFPA’s headquarters building, which is located in the privately-owned Batterymarch Park office park, the public way is a good 1/3 of a mile from our front doors. In a case like this, it’s not uncommon to invoke the provisions for equivalency in Section 1.4. When we have our fire drills, we don’t evacuate all the way down to busy Route 37 (our “true” public way); rather, we evacuate to designated areas in the parking lot, depending on which division we work in. This gets us safely away from the building and responding fire department apparatus, which satisfies the intent of the public way. If you’re not sure where your public way is, have a conversation with your local authority having jurisdiction so you’re both on the same page. It could save a lot of hassle down the road should the question arise during an inspection. The intent of the definition of public way is to establish an end point at which the means of egress terminates, is not under the jurisdiction of the Code, and to which the Code’s requirements do not apply. As such, the Code intends a situation where occupants egressing from a building ultimately reach a point where they can move away from the building unimpeded and no longer need the protections of the Code. What this all boils down to is, the exit discharge needs to be maintained all the way out to the public way, whether it’s the true public way, or an approved equivalent public way. Here we see young Friedrich clearing snow away from the rear exit at the Von Trapp Brewing Bierhall. (I made up the 'Friedrich', but notice the short sleeves. Vermonters are a hearty lot!) Be sure to know where your public way is, and make sure your building’s occupants can safely get there. Life safety doesn’t get to take a snow-day! For many people, it’s impossible to remember a time when mass shootings like the ones at Columbine High School, Virginia Tech, and Sandy Hook Elementary School were implausible. Born in 1992, I’m certainly one of those people. But in 1966, these types of events were unheard of, which made the August 1, 1966, University of Texas at Austin clock tower shooting all the more devastating. “Tower,” a documentary film about the incident, which is considered America’s first mass school shooting, will air on PBS tonight at 10 p.m. EST. I wrote an article about the film for the current issue of NFPA Journal. The UT shooting catalyzed the creation of SWAT teams across the country. Later mass shootings prompted further changes to law enforcement response to active shooter incidents and sparked a discussion among life safety experts on the role of codes and standards in addressing such events. The NFPA Standards Council has received a request to develop a standard on preparedness and response to active shooter scenarios. The February 2017 issue of NFPA News, our free monthly codes and standards newsletter, is now available. As an electrical industry professional, following the NFPA 70: National Electrical Code (NEC) protects communities - people and property - from electrical hazards, and helps build a safer world. NFPA offers a convenient way to access the 2017 NEC when you’re out in the field. The 2017 NEC includes hundreds of updates along with five brand new articles. The latest edition of the code paves the way for safer electrical installations. The 2017 NEC app, available for both Apple and Android devices, not only gives you the flexibility and ease you want on the job, it has a number of new features that you, our partners in electrical safety, have asked for. Get the 2017 NEC app today by linking to the iOS version for Apple products or Google Play for Android, and experience for yourself all of the positive results on your next job assignment. In New England, February brings the heart of winter. A balmy 20 degrees, a fresh 12" of blizzard blown snow, and 50 mph winds. What more can we ask for? For those of you in the warmth and sunshine, I envy you. Unfortunately, winter comes with its share of safety hazards, especially during and after a snowstorm. A few weeks ago I wrote about the importance of digging out fire hydrants and providing adequate clearance for fire department operations. I checked this morning and all hydrants in my neighborhood are clear, another snowstorm success! While a hazard all year round, another hazard especially present during the cold winter months is carbon monoxide. During and after a snowstorm, vents for dryers, furnaces, stoves and fireplaces can become blocked by the pile up of snow. Generators may be used when there is a loss of power. People often warm up their vehicles in advance. Heating equipment is used more frequently and could malfunction or may be used in unsafe locations. All of these situations pose a threat to the development of CO. Without CO detection and warning equipment, as required by the Code, its presence is virtually impossible to detect. For additional information on carbon monoxide check out NFPA's safety resources, including a tip sheet, toolkit, facts and figures and research report. Happy Friday! Stay safe...and warm! Two years ago, a fire completely destroyed a 408-unit AvalonBay complex in Edgewater, NJ. Light weight construction was suspected as contributing to the fire’s quick spread. According to an NBC online news story, “One responding fire chief told NBC 4 New York he thought lightweight wood construction was a factor in how quickly the fire spread.” The same apartment building burned to the ground during its construction in 2000. This week’s fire at the Maplewood complex has generated renewed concerns about the rapid spread of fire in lightweight construction. “There are fresh questions about lightweight wood construction for large apartment complexes following a six-alarm fire in Maplewood over the weekend,” stated a CBS New York report. Whatever the cause of the fire and its spread, there are measures that can be taken to reduce the risk of fire in buildings under construction, which are specified in NFPA 241, Standard for Safeguarding Construction, Alteration and Demolition Operations. While NFPA 241 has been a lesser known standard, its adoption among jurisdictions is increasing. The City of Boston has adopted NFPA 241 for a number of years. The standard required statewide in Massachusetts through its adoption of NFPA 1, Fire Code , where NFPA 241 is referenced. The requirements of NFPA 241 provide measures for preventing or minimizing fire damage to structures, including those in underground locations, during construction, alteration, or demolition. NFPA 241 addresses temporary construction equipment and storage; processes and hazards such as hot work, waste disposal, and explosive materials; utilities; fire protection; and safeguarding construction and alteration, roofing, demolition, and underground operations. The standard also requires that the owner designate a person who shall be responsible for the fire prevention program and who shall ensure that it is carried out to completion. That fire prevention program manager has the authority to enforce the provisions of this and other applicable fire protection standard and that the fire prevention program manager must have knowledge of the applicable fire protection standards, available fire protection systems, and fire inspection procedures. The next edition of NFPA 241 could be issued this fall and will contain a new Chapter that will address tall timber structures, a new genre of construction that is increasing in popularity. The remains of the U.S.S. Lafayette on the Hudson River following a five alarm fire. On February 9, 1942, the U.S.S. Lafayette (formerly the Normandie) caught fire during its conversion from a French luxury liner to an American troop ship. Built in 1931, this ship was the first to be constructed following the guidelines in the 1929 Convention for Safety of Life at Sea. Thus fire again has struck a major blow against America's war effort. This vessel, which was France's greatest luxury liner broke the speed record for the Atlantic crossing on its maiden voyage, was being converted for use as a troopship... the fire was not attributed to sabotage but to careless operation of an acetylene torch. The United States District Court for the District of Columbia (Hon. Tanya S. Chutkan) late last week issued a ruling that will support federal, state and local governments’ efforts to support public health and safety through the use of voluntary consensus codes and standards. On February 2, the court granted a motion for summary judgment filed by a number of standard development organizations (SDOs), including NFPA, ASTM International and ASHRAE. The court’s ruling permanently enjoins Public.Resource.org from its previous systematic infringement of numerous SDO copyrighted codes and standards. The ruling vindicates the longstanding public-private partnership pursuant to which government entities may, if they choose, incorporate by reference high quality safety codes and standards. We are very pleased with the court’s thoughtful and well-reasoned decision, which recognizes the importance of a time-tested process that serves governments and individuals well and is vital to public health and safety. The history of not-for-profit SDOs developing voluntary consensus standards goes back more than a century. Governments, businesses, and individuals across the country rely on a wide variety of works, from product specifications and installation methods to safety codes and standards. SDOs, not resource-constrained governmental agencies, underwrite the substantial costs of developing standards. SDOs pay for the standard development process and invest in new standards with the money earned selling and licensing their copyrighted works. This model allows SDOs to remain independent of special interests and to develop up-to-date, high-quality standards. It also allows the U.S. government – and governments at all levels – the freedom to decide whether to incorporate these standards by reference without a drain on their limited resources. NFPA has provided free access to all of its codes and standards for more than a decade. Many other SDOs also provide free online access to many standards as part of an overall commitment to safety. The standards development process is an excellent example of a successful public-private partnership that benefits business, government and individual citizens. More information about the importance of codes and standards and how to get involved can be found on NFPA’s website. In Part 1 of this series we discussed a novel example of a total wellness program. In Part 2 we discussed ways you and your department can implement a Total Wellness Program in your service starting tomorrow. This time we will talk about the future. One of the really cool things the @NFPA does is send our staff liaisons out as much as is possible and reasonable so we can learn what new practices and resources are out there and bring that information back to our technical committees. Our technical committees ultimately decide what is put into a code or standard but even if somethings don’t make it in, we as an organization want to make sure we are sharing that knowledge and information with the world. In my very short time with the association I have been so lucky to have been able to travel and learn from innovators all over the Country. There are some really amazing things on the horizon for our emergency responders. From innovative technology that uses the biometric sensors in smart phones to better track exposure times, to resiliency programs that focus on not just the responder but their families as well and create a healthy means for them to work through their stresses and issues. One of the coolest concepts that is being discussed is the “Tactical Athlete.” This is the best term I have ever heard to describe our responders. Now you may hear this and think it “tactical, like totally tough and kick in doors and chase bad guys” but that’s not what they mean by this. The context in which this was first presented is in the world of injury management. Traditionally, if a responder gets hurt, they go to see an occupational health physician and that doctor refers them to specialists, but manages their injury and rehabilitation. In the world of the tactical athlete, injuries are managed by sports medicine physicians. This is because a first responder isn’t like someone who works in an office environment. Occupational doctors see patients and try to best manage their care to get them back to their specific occupation. For the most part, not always but mostly, these are people who work in an office or manufacturing who have a repetitive use injury and need to be rehabbed just enough to get back to work. the needs of responders and looked at innovating their care, there is still things that a sports medicine doctor has access to that they don’t. Our responders sometimes do repetitive motion (ie; EMTs lifting and moving patients), go from complete rest to running upstairs and ladders (ie; fire fighters), and even go from an excited state to a completely aerobic state (ie; police officers in a foot chase). All of this variation and stress takes a toll on the body similar to an athlete who exercise and makes repetitive motions for their skill but also has moments of complete change. Your body must be flexible and maintained in such a way that it can handle these stresses. This flexibility and maintenance is what the sports medicine doctors specialize in. A sports medicine physician also can reduce the time in which a responder is out of work. They do this by accelerating the time it normally takes to get imaging, make care decisions, and perform procedures. In the traditional model, you would still have to see an orthopedist but after being referred and possibly treated by an occupational physician first. There are less layers in the new model. I spent some time with a sports medicine physician recently discussing this model. Dr. Jennifer Luz is a sports medicine physician with Steward Healthcare in Boston and is one of the team physicians for the Boston Ballet, Boston Cannons Lacrosse team, Boston Breakers Women’s Soccer Team, and several local colleges. Dr. Luz has always had an interest working with first responders as the granddaughter of a police chief and the daughter of a federal agent. She was a resident at Spaulding Rehabilitation Hospital in Boston and was involved in the care of victims and responders that where at the events of the 2013 Boston Marathon. Dr. Luz recently made as simple analogy; “If Tom Brady hurt his shoulder, he would have an MRI within a day and surgery within a week. This would be to not only expedite his recovery, but also to prevent any further damage while waiting for care or approval to receive care. Why is a first responder any different? Don’t we need to get them healthy and back at working helping/protecting us?” This point illustrates the importance of changing our mindset and looking at responders in a different way. T here’s more to the tactical athlete concept than just the way responders are cared for. There’s a component of maintenance that must accompany the care. Maintenance of not just the body but also of the mind and spirit. Many departments are looking at innovative ways to promote health and wellness as it relates to tactical athletes. Some are working with companies to improve fitness like Boston with their O2X program. Others are bringing in Yoga instructors to increase endurance and flexibility. In Indianapolis they are conducting a nutrition study measuring the heart walls of fire fighters and trying to create ways to reduce cardiac issues in the fire service. There is a behavioral component too. Finding mental health clinicians that understand the responder world and life, performance coaches, mindful coaches, and working with families to integrate them into department life. When you step back and look at all of this, you have to ask… Why? For too long being a responder has been too dangerous of a job. Too many have died both on the job or too early after suffering a heart ailment or from the terrible effects of cancer. How many have left the profession due to mental illness? How many of your co-workers both past and present have taken their lives? How many families have been broken up because of the ravages and stress of these jobs? How much money have you or others lost by being unable to work, either at your job, or if you’re a volunteer, at your day job because of an injury suffered helping others? How much money has your department spent covering your shifts or expenses while you are out injured? Is this money that could have gone to other programs? The world of working as a first responder is hard. The hours are long, the calls can be stressful, and frequently people feel like they are alone. The long shifts and especially busier call volume days can create terrible eating habits and reduce your exercise and effort when you aren’t at work. Many first responders get home for their shifts and just “crash out” this is the phenomenon of decompressing and isolating yourself while eating and watching tv or playing vi deo games. This frequently occurs because of the time they spend in a heightened state of adrenaline or excitement on their shifts and the body dumping and wanting to achieve balance. Many feel as though their work is a family and their home is a family, but they have difficulty integrating the two. The total wellness program and tactical athlete concept, as conceptualized, will intervene, help develop healthy eating and exercise practices, improve mental performance and coping mechanisms, and include their loved ones and make them feel as though they are a part of this process. Long term benefits could include, reducing the number of cardiovascular issues, behavioral health issues, and cancer victims. For the department they will reduced overtime and worker’s comp expenses, have an easier time keeping staffing adequate, and improve moral. I know that for me (pictured)... This is something I certainly would have loved to be a part of in my time on the streets! It’s a win-win! ). In summary, occupants must be able to open an egress door with not more than one simple operation, without the use of keys, tools, special knowledge or effort, and under all lighting conditions, including no light. Traditionally, doors have been secured closed mechanically; go up to the door, operate the releasing mechanism which mechanically retracts the latch, and the door opens. These days, thanks to Alexander Hamilton’s invention of electricity* (that was for my daughter), doors can be secured closed by electronic means, using electromagnets and electronic control hardware. Instead of mechanically releasing a latch, the occupant operates a releasing switch, which sends a signal to the control hardware, which in turn drops the power to the electromagnet and allows the door to open. From the occupant’s perspective, this door operates the same as a door with mechanical latching hardware. Mechanical latches are pretty simple – not a lot of opportunity for failure. Electronic systems are more complicated and have more potential failure modes, so the Code needs to address them. (1) The hardware for occupant release of the lock must be affixed to the door leaf. (2) The hardware must have an obvious method of operation that is readily operated in the direction of egress. (3) The hardware must be capable of being operated with one hand in the direction of egress. (4) Operation of the hardware must interrupt the power supply directly to the electric lock and unlock the door assembly in the direction of egress. (5) Loss of power to the listed releasing hardware must automatically unlock the door assembly in the direction of egress. (6) Hardware for new installations must be listed in accordance with ANSI/UL 294, Standard for Access Control System Units. Where these criteria are met, the door should operate just like any other egress door, and it is not considered a special locking arrangement. Special locking arrangements are addressed in 7.2.1.6; I’ll discuss those in a future post. Just yesterday, I had an advisory service call about electronic locks. I knew immediately what the caller was going to say – I hear it all the time. “I have a door that’s locked with an electromagnet. To get into the facility, you swipe a key-card and the door unlocks.” No problem, NFPA 101 doesn’t care about occupants’ ability to get into the building - only their ability to get out. Caller: “It’s also tied into the fire alarm system, so the magnet will release when there’s a fire.” To which I replied, “I see. And how does someone get out under normal conditions?” Caller: “Oh, they have to swipe a key-card.” Me: “I see. What if they don’t have their key-card?” Caller: “Well, it will unlock if the fire alarm goes off.” Me: “What if the fire alarm doesn’t go off for some reason?” Caller: “Oh, there’s a push-to-exit button on the wall by the door.” President Trump: “WRONG!” While this might sound like a compliant arrangement, it’s not, because to open the door, an occupant would need to know about the push-to-exit button, which might not be visible in an emergency if the lights go out (special knowledge). The door has to be able to be opened by releasing hardware attached to the door leaf, which is typical of mechanically latched doors, and is a requirement for electrically controlled egress doors. Another question we sometimes get relates to standby power. If the electronic locking system is provided with standby or emergency power, are the doors required to unlock if the building loses power? The answer is no, as long as the system functions like it’s supposed to when powered by an alternate source. If the electronic system loses primary power and there’s no backup, the locks are required to fail-safe – that is, unlock. The Life Safety Code got its start as the Building Exits Code; I can’t overemphasize the need to provide building occupants with free egress. If the provisions I’ve described here are followed, security can be provided without sacrificing life safety. I hope you’ll return for a future installment of #101Wednesdays. Until then, stay safe! The topic of vacant buildings seems minute in the scale of the Fire Code provisions, and the provisions can often be overlooked. However, vacant buildings, especially those of combustible construction, pose a hazard to adjacent exposures, fire fighters, and the community and can often be the scene for disastrous fires during the cold winter months. For example, 6 fire fighters in Worcester, Massachusetts, died on December 3,1999 fighting a fire in an abandoned cold storage warehouse. Two Chicago, Illinois, fire fighters died while fighting a fire in an abandoned warehouse on December 22, 2010. Vacant buildings of totally fire-resistant construction that are void of any combustible contents and that pose no hazard to exposures might be exempt from maintaining fire alarm, sprinkler, and standpipe systems where approved by the AHJ. The AHJ may also require other systems or components pertaining to fire protection to also be maintained. This might include fire doors, fire barriers and other passive or active systems. Finally, the AHJ has the authority to require an inspection and test of any fire protection system or fire alarm system that has been out of service for 30 days before restored back into service. Whenever a fire protection system is shut off for an extended period of time, an inspection and test of the system for system integrity are necessary before the system is put back in service. When any system is out of service, the potential exists for damage or vandalism that might not be detected until the system is tested. Moral of the story...don't neglect vacant and seasonal buildings. Even though they may not be occupied, they still pose a threat to firefighters and the environment around them. Following the guidelines of the Code will help make sure these buildings stay on the radar and are properly maintained. Electrical professionals, you’re invited to put your NFPA 70: National Electrical Code (NEC) knowledge to the test with NFPA’s new NEC Challenge app! The NEC Challenge App is compatible with any Apple or Android product and is available on Google Play, as well. The best thing about it? The app is free! Want to take it up a notch? For only $4.99, you can access additional questions and play against your colleagues for the ultimate challenge. What’s more, this interactive game gives you the chance to study the NEC and it’s a great way to prove your superior code knowledge and compete against your peers in a really fun way. The Challenge allows you to earn points, reach new levels and move up the NEC Challenge leaderboard all from the keypad of your phone. So what are you waiting for? Download the NEC Challenge app today, put your best foot forward and demonstrate your ultimate NEC knowledge! Need more information about the NEC? You can find it all at www.nfpa.org/70. Every year, NFPA sponsors Fire Prevention Week. Our kindred organization, the American Burn Association’s National Burn Awareness Week runs from February 5-11. This year, the focus is the Mechanisms of Burn or the M.O.B. The MOB is a collection of unsavory characters including Larry “The Steamer” Liquids, Christy “the Flame” Candles” Thomas, “The Surface” Irons, William “The Wire” Electricity,” and Chris ”Hot Stuff” Chemicals. You can see the Wanted poster at http://www.ameriburn.org/nbaw/NBAW_Poster.jpg . Most of our readers know that cooking is the leading cause of home fires and home fire injuries and one of the leading causes of fire deaths. Despite the fact that many of us have experienced minor burns while cooking, many people are surprised to learn that most burns associated with cooking equipment, cookware, and tableware in 2014 were caused by contact with a hot object or liquid rather than by fire or flame. The most common types of cooking burns occurred when someone came in contact with or touched a hot range or oven, followed by contact with hot cookware, cookware scalds and tableware scalds. Children under five face a higher risk of non-fire burns associated with cooking or tableware than of being burned in a cooking fire. Pre-schoolers accounted for three of every five tableware scalds. For more information, see NFPA’s Fact sheet on non-fire cooking burns. NFPA’s report Characteristics of Home Fire Victims shows in 2007-2011, U.S. fire departments reported that that smoke inhalation was the primary apparent symptom in 40% of home fire deaths and 42% of home fire injuries. Forty-six percent of the deaths, and 13% of the injuries involved both burns and smoke inhalation. Only 5% of the deaths and one-quarter (24%) of the injuries were caused by thermal burns alone. NFPA is grateful to the American Burn Association for getting the burn prevention message out there. Many safety tips can prevent fires and non-fire burns. For example, keeping young children three-feet away from hot kitchen stoves helps protect them from contact burns and scalds from pans of hot liquids. I sure am glad that I am not a contract employer. Their calls to me often end up with same statement being made at one point or another. That statement is “if I don’t do the work energized my competitor will”. Take the job to get paid or pass up on the job and don’t get paid. That is the decision in a nutshell. Unfortunately, when it comes to electrical safety there is another decision that you are making at the same time. That decision is whether or not to risk your safety or the safety of your employee. Often the host employer wants energized work to be conducted because they do not want to lose revenue. They have already made their decision that your safety is not as important as their bottom line. That is a scary prospect in its own right. You explain the issues with this. You cover everything from equipment damage, extended downtime, and loss of production anyway. That may not sway them and they may still want to risk your safety. You then cover the lead time in getting the new gear in, the cost of that new gear and finish up with the potential for injury or death. Finally, the host employer sees the light. This very often leads to the next problem that you often face. A meeting is held to go over the host employer and your duties (Article NFPA 70E®, Article 110 addresses some of the things to consider for each role.) The host not only has no knowledge of any electrical hazards but has no equipment labels, no single line drawings, no safety program and no maintenance program. This concerns you since the seemingly simply task of operating a disconnect switch now presents a far greater hazard and risk of injury then if these things had been done. You show them your lockout/tagout procedure, provide information on the work procedures that you will use and explain the benefits of proper PPE. Luckily for you the host wants to do things right. They now realize that their employees are at risk of injury each time they operate equipment. Not only do they want you to do the original work but want you revamp the entire electrical system during the scheduled week long shutdown. Damage equipment is repaired or replaced. Circuit breakers and fuses are installed with the correct ratings. The short circuit current ratings of equipment are verified to be suitable for that point on the distribution network. All equipment is labeled to facilitate establishing an electrically safe work condition. Before you leave the work site, you educate them on justified energized work, help them establish lockout/tagout procedures, move them in the right direction for equipment maintenance, and leave them a copy of NFPA 70E. From that point on you are their electrical contractor. We all know this is all too often a fairy tale. Equipment maintenance is sacrificed. What was on the truck has been installed even if it is not quite correct for the installation. In house installations do not comply with the National Electrical Code®. Short cuts are taken to maximize revenue. Someone not knowledgeable about safety may take the job. Safety may give way to receiving a paycheck. Imagine though if everyone did what is right. Everyone proactively implements electrical safety policies and procedures. An equipment maintenance program is not seen as being unnecessary but a critical aspect of safety for anyone interacting with electrical equipment. The default electrical work procedure is an electrically safe work condition. When energized work is conducted, it is justified for the task and protective measures are taken to minimize the worker’s injury if an incident does occur. Both the host employer and you follow NFPA 70E. In that world you do not have to consider risking your own or your employee’s safety to get paid. Utopia. Until then I am glad I don’t have to make the decisions you are faced with. Next time: Going without an energized work permit. We took some time to interview local fire departments in the U.S. wildland-urban interface (WUI) and have recently published our findings regarding preparedness gaps in the safety and protection of firefighters, in a new report. Through interviews with fire officials who had experienced a major wildfire within the last five years, we examined whether and how local fire departments change and adapt following a major fire event. The report also identified critical factors that facilitate or constitute barriers to being better prepared and ready to control and mitigate a wildfire incident in their communities. The complete report, “Wildland-Urban Interface: Fire Department Wildfire Preparedness and Readiness Capabilities,” also includes recommendations for safety improvements that point to WUI firefighting equipment, firefighting training, and the health and fitness of firefighters. Take a look at some of the key findings as well as find the complete report available for free, by viewing the press release distributed on the topic. Police in Istanbul yesterday defused a situation that could have turned deadly when a patient at a hospital threatened to shoot himself and others, BBC news reported. The incident underscores the need for health care facilities to be prepared for the threat of an active shooter, a topic I reported on in the current issue of NFPA Journal ("Perspectives," January/February 2017). For the piece, "Wide Open," I conducted a Q&A with Michael Marturano, safety officer for a health care system in Minnesota. In the interview, Marturano, who has led active shooter trainings for health care workers at more than a dozen facilities in Minnesota and Wisconsin, discussed why it's important for health care facilities to be prepared for these kinds of incidents, as well as the challenges presented in keeping facilities both fire safe and prepared for active shooter situations. No injuries resulted from the incident that took place in Turkey yesterday. The psychiatric hospital was evacuated as police negotiated with the gunman, who was identified as a young police officer who has been receiving treatment at the facility for two years. The man was not allowed to carry a gun, according to a doctor at the hospital, and it is unclear how he obtained the firearm used in the incident. Similar situations have not ended as peacefully. In 2015, for example, a former Army soldier shot and killed a psychologist at a Texas veterans' hospital before turning the gun on himself. From Doney, Peter, and Alexander P. Cochrane. Sprinkling car for mines. US Patent US 902950 A, filed January 25, 1908, and issued November 3, 1908. "This invention relates to sprinkling cars for mines, and the primary object of our invention is, to provide a novel sprinkling car or water tank that can be moved back and forth in a mine, to allay dust therein, such as coal dust." For more information regarding fire history, please feel free to reach out to the NFPA Library. The NFPA Archives houses all of NFPA's publications, both current and historic. Library staff are available to answer reference questions from members and the general public. It’s been quite a year for Joe Vellano. The 28 year-old defensive lineman was preparing for the Patriots’ pre-season finale against the New York Giants in August when he received news that his Attleboro, MA apartment had been totaled by a fire. Vellano was too concerned with the game, which his roster spot depended on, to worry about the fire, and passed it off to his family to take care of until he returned. When he returned home, he salvaged what he could, although most of his belongings, including gear from the 2014 Super Bowl victory with the Pats, were destroyed. Left temporarily homeless, he was forced to sleep on a friend’s couch until he was cut from the team just two days later in the final round of roster cuts. Vellano quickly bounced back from his rough week and was signed to the Atlanta Falcons practice squad. He worked his way onto the active roster during the season and is now preparing to face his former teammates in the Super Bowl. Though he was a member of the 2014 Patriots team, he was inactive, so this Sunday will be his first real taste of Super Bowl action, something he has dreamed about since he was a child. “To get a chance to take live bullets in the Super Bowl is what I’ve been trying to do since I was 4 or 5 years old," Vellano told NESN. Vellano joined the active roster for the NFC Championship game two weeks ago and is now preparing to face off against his former team in the biggest game of his life. Earlier this week, fire erupted at the former Alexander Smith carpet factory in Yonkers, New York. Multiple floors at the YOHO artist’s community were engulfed and the fire quickly escalated to a general alarm, with every on-duty firefighter in the city called in to help. The blaze started at 4:00 a.m. and by the time the fire was under control at approximately 8:45 a.m., a total of 80 firefighters from 18 companies were on the scene. This fire, though not deadly, comes just two months after a fire in an Oakland warehouse used as an arts collective killed 36 people. The tragedy highlighted the importance of the adoption and implementation of fire codes, as discussed by NFPA President Jim Pauley in an interview with the New York Times. Luckily, the Yonkers fire occurred at a time when nobody was in the building, but it serves as another disturbing reminder of an alarming recent trend in building fires, and the importance of building codes like NFPA 1, the Fire Code. The Yonkers building dates back to the late 19th century, and was home to a carpet factory until 1954. The building is now home to artists’ work lofts and other businesses. According to Yonkers Fire Commissioner Robert Sweeney, the fire seemed suspicious partly because it occurred at a time when no one was expected in the building. Also, it seemed to be contained in just one corner of the large structure. Arson has not been ruled out as the investigation is ongoing. We periodically get questions here at NFPA HQ about how the Life Safety Code gets applied to existing buildings. New construction is usually pretty straightforward: design the building in accordance with the prescriptive requirements for new construction and call it a day. (Sometimes easier said than done, but in general that’s the way it goes.) But how does it work with a 100 year old hotel? Or a 10 year old hospital? Or any existing building? And what about changing the physical configuration or use of an existing building? That’s where things start to get interesting and we have to dig a little deeper into the Code. 3.3.36.5* Existing Building. A building erected or officially authorized prior to the effective date of the adoption of this edition of the Code by the agency or jurisdiction. As a hypothetical example, let’s say a jurisdiction adopted the 2015 edition of NFPA 101 with an effective date of June 1, 2016. Any building constructed or authorized prior to 1/1/16 would be considered an existing building, and the Code would apply accordingly. By default, anything constructed or authorized on or after 1/1/16 would be new. Jurisdictions typically establish by policy what is meant by “authorized.” It might mean the building permit was issued prior to the Code’s effective date. If the building permit was issued on 5/30/16, the building might be required to meet the new construction requirements of the previously adopted edition of the Code, provided it received its certificate of occupancy within some specified time-frame. Once the building is complete and occupied, it is instantly an existing building under the currently adopted edition of the Code. 4.6.7.4* Existing life safety features that exceed the requirements for new buildings shall be permitted to be decreased to those required for new buildings. 4.6.7.5* Existing life safety features that do not meet the requirements for new buildings, but that exceed the requirements for existing buildings, shall not be further diminished. Even though the building in my example is existing, it was built to the new construction requirements of the previously adopted edition, and any life safety features that meet the requirements for new under the current edition must be maintained as required for new. Consider the hospital example; if it was new construction under the previously adopted edition and required 8 ft wide corridors, the 8 ft wide corridors must be maintained because new health care requires 8 ft corridors in the currently adopted edition, even though existing health care only requires 4 ft corridors. If the hospital had 10 ft wide corridors, they might be able to be reduced down to 8 ft; however, it would have to be determined whether they were required to be 10 ft for a particular reason (possibly as part of an equivalency or performance-based design). Be careful when reducing or eliminating any existing life safety features; it’s always a good idea to check with the AHJ first. Now consider a much older hospital with 3 ft corridors. We sometimes get the question, “Are the existing occupancy provisions of NFPA 101 intended to be applied retroactively?” The answer is, YES. Based on the existing health care provisions of the currently adopted edition, the 3 ft corridors would need to be widened to 4 ft, even if no change is being made to the facility. The Code prescribes minimum requirements for safety to life from fire and similar emergencies in both new and existing buildings. For the most part, all buildings must comply with, at least, the requirements for existing buildings. Where changes are made to an existing building, such as reconfiguration of a space or a change in the way the building is going to be used, the requirements of Chapter 43, Building Rehabilitation, will apply. Under older Code editions (pre-2006), any change had to comply with the requirements of new construction. This was often impractical for older, existing buildings. Chapter 43 tempers the requirements to promote the adaptive reuse of existing buildings. In some cases, the existing occupancy requirements apply. In others, new construction requirements apply. The application depends on the rehabilitation work category, which is a subject for another day. Now if you happen to attend a Life Safety Code seminar that I’m facilitating and I ask in which chapter would you have to look to determine whether an existing business occupancy can eliminate its emergency lighting to reduce maintenance costs, you will emphatically reply…. “Chapter 38, New Business Occupancies!” The reason is, of course, an existing life safety feature can be eliminated only where it is not required for new construction. Hopefully this clears up some misconceptions. Feel free to comment below if you have questions or comments. Thanks for reading, and until next time, stay safe!